Swisse Ultiboost Menopause Balance is designed as a formula for women reaching menopause and experiencing symptoms such as hot flashes and excessive night sweating. The ingredients in Swisse Ultiboost Menopause Balance are especially selected to treat such symptoms, and, in general to ensure women’s well being as they age. The formula also includes minerals and vitamins needed for overall health and the prevention of osteoporosis which is a good thing. Here is our review on this natural menopause supplement. What Does Swisse Ultiboost Menopause Balance Contain? The isoflavones found in soy bean are very effective in reducing the intensity of hot flashes and night sweating. Sage is an ingredient with known benefits for reducing night sweats, as well, while black cohosh is a herbal extract traditionally used to help women alleviate hot flashes associated with menopause. Calcium and vitamin D are useful for preventing osteoporosis, so they are great additions to the formula. Swisse Ultiboost Menopause Balance is designed as a nighttime formula, which is why you need to take two capsules in the evening, before going to bed. The listing price for a bottle with 60 capsules (one month supply) is 34.99USD. We did not identify any guarantee being offered on the manufacturer’s website, and, since this product is sold only through third parties, any refund and return issues may have to be discussed with them. Swisse Ultiboost Menopause Balance seems to be a well balanced product, as it contains herbal extracts for combating hot flashes and night sweating. Taking this supplement can help improve the quality of your sleep. The additional compounds help fight the onset of osteoporosis, as well. However, since the symptoms of menopause can be much more varied, it is important to look up some other products, as well, that can offer better fighting chances against such side effects. 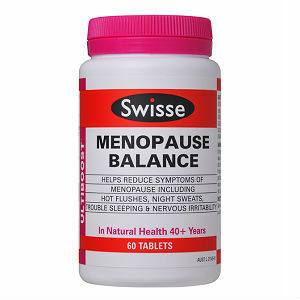 Jackie Horowitz	reviewed Swisse Menopause Balance	on October 11th	 and gave it a rating of 2.5.